I bought the country red and it is truly beautiful!!! I love the color and it looks wonderful in my room! I was a little disappointed when I seen how lite it was though, it is not a true bench. At least I wouldn’t want to sit on it daily I would be scared it would break down very quickly. Make room for storage and style with this handsome bench. Utilized in the entryway or mud room, this sturdy and attractive bench immediately welcomes people to sit and remove their shoes, leaving them in the handy baskets. Dimensions 15.25 In. X 42.0 In. X 19.5 In. I love the Gray Barn Old Stone Bench with Woven Baskets. Perfect size and I can store a lot in the baskets. Great looking piece and it matched my other furniture. I'm very happy with this purchase. CHEAPLY MADE! DO NOT BUY! DO NOT BUY! This bench would have been perfect for our needs (size, style, color, etc). But it was so cheaply made! The first one arrived damaged, in numerous places. Sent it back for a new one. The second one arrived damaged even worse than the first. The "wood" just crumbles apart. Would not recommend buying this, you'll just have to go through the hassle of returning a broken piece of furniture. Purchased this for our Executive suite restroom and it does not disappoint. It was a little shorter than expected; however, the addition of a silk orchid and tissue box concealed the shorter height. This bench was shipped in one piece; nothing to put together and it is very high quality. We are extremely happy with The Gray Barn Old Stone Bench with Woven Baskets. I was looking for this bench everywhere and found it cheapest on Overstock!! The shipping was great. beach was covered in multiple box and had extra cushions around the corner. It fitted my mud room perfectly. The quality of the bench is great and very well made. The drawers and baskets are perfect to store small stuffs. I love it! 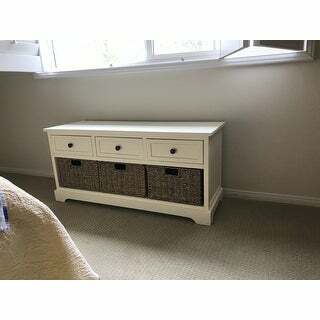 It was more than expected, I purchased it in white, it looks amazing in my bedroom, it has 3 small drawers and 3 baskets. I would recommend this item. We are using this bench in the mud room. It is solid enough to sit on so that is great. The quality of the wood is questionable and it is VERY light (which makes it easy to move around). It arrived with two nicks in the wood along the edge of the bench. They are very noticeable but as it is in the mud room I used permanent marker to cover them up. It worked but wouldn't want this in a place of prominence. Perfect for my small entry. The bench is sturdy enough for my big husband to sit and remove his shoes. 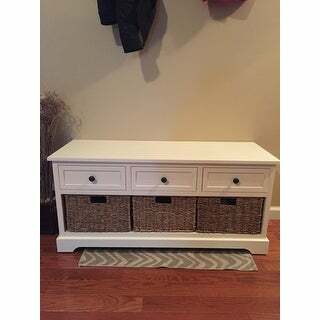 The drawers and baskets are great for storing mittens, scarves, hats,etc. This was purchased for my grandsons toys.. so my living room didn't look like a playroom.. :) I love it .. it is heavy duty and durable for the beating it takes from them. It is perfect for the house and looks amazing in the room and no one know that the toys are hidden in the baskets and drawers . It has also taught him to put toys away when done. I purchased this bench for my daughter's bedroom..it came in one piece, which was awesome! 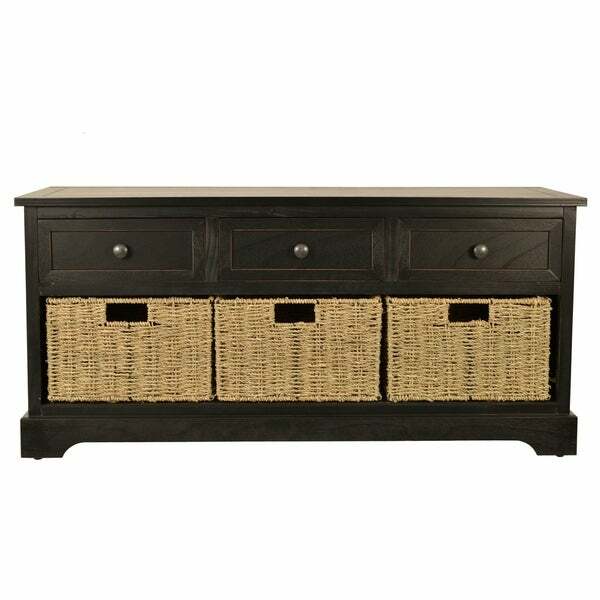 It is nice and sturdy and built well...The baskets are perfect for storage. I liked it so much, I purchased another one in a different color. Beautiful piece, good price , no assembly required. I love it! 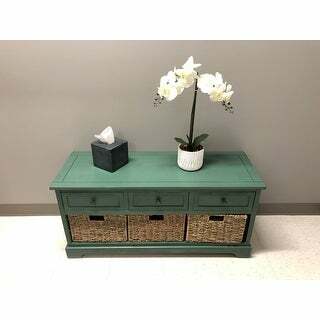 This storage bench looks great as an entry way piece! The color is off-white. The drawers aren’t very smooth to pull in and out so that’s why I gave it 4 stars. We use the drawers for hats, gloves, and scarves for winter. It’s a great place to throw backpacks and purses too. the baskets shed a bit making it kind of messy sometimes- otherwise the piece as a whole was very sturdy and worth the price. came completely assembled too which was nice! Sturdy bench and good storage space! This product is absolutly beautiful in person! I didnt know how it would go with my blue living room and it fit perfect!! Very sturdy! I would defentily recommend this for a entry bench lile I did! The product arrived damaged, called customer service and they were phenomenal. I really like the product and looks great! Besides the damage everything is ok. Overstock.com replaced my damaged item. It looks beautiful in my livingroom. 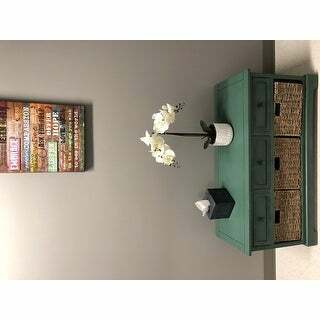 Nice little bench and storage cubbies. We use it to store cycling shoes and other equipment for our Peloton bike. I made a seat cushion to fit on the top. Very nice looking. I love this beautiful bench! It came well packaged with no imperfections! One thing I would say is the color samples online don't match the actual color. The iced blue looks nearly white online but in reality it's more seafoam mint. I happen to love it though! This is a great product. I would definitely buy again. Came already furnished, well packaged and protected/ Nice dark color. Baskets are nice and heavy, well made. Looks great in my entry way. No more unsightly clutter. "Is the back painted to match the rest of the bench?" "Can this be used as a coffee table? Is the back side closed in or open?" "Is this available in blue?" "The photo for the white bench looks taupe. Which is it?" It is on off white, not bright white. "Can the baskets be completely removed so that the bottom self can be used to hold stuff?" Yes, the baskets can be removed. "The photo for the gray bench looks brown. Could someone who ordered the gray bench describe the color as it looks in person?" "how much weight will this hold? I need it for extra seating."